Kristen Bonkoski presents 4 useful tips for riding in low light with children. As Spring and Summer are fast approaching, the days are getting longer with a promise of sun-filled evenings. But, right now and maybe even for the next couple weeks, the days are still shorter with dusk falling so much quicker than it will at the peak of July. 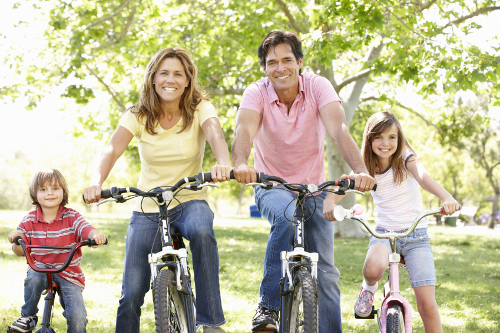 If you’re trying to squeeze in some after-school, after-work evening rides or just some active time with the family why not read these tips so you’re never caught off guard by the setting sun. Rather than adding bike lights to your bike every time you go for a ride, why not add some fixed lights that you can leave on for times where you find yourself racing the sun. Kristen recommends the lightweight Knog Frog lights for children as they are light and have a great battery life span. Reflective tape can do a lot, so why not add it to your kids’ helmets, wheels, bike frames and backpacks? Although reflective vests are great, ankle and knee reflectors are actually more effective. A 2012 study found that drivers saw cyclists with reflective knee and ankle straps 94% of the time, whereas, they saw cyclists with a reflective vest 67% of the time. In the evening why not give off-road riding a go with the children. Riding trails and canal paths in the dark can be a great adventure.